Apterae of Cinara pinea are shiny orange-brown early in the year (see first picture below) and grey or dark brown later on. The body is finely spotted with black and dusted with wax especially along the dorsal midline and laterally. The spots are black scleroite plates at the base of many of the hairs, especially on segment III-VI, and they are irregular, often confluent and of varying size. Siphuncular cones are small to medium sized and reddish-brown or dark brown. The body size of Cinara pinea apterae is unusually large at 3.1-5.2 mm. The alate Cinara pinea (see second picture above) has pronounced wax spots along the centre line of the dorsum, and the size and number of the dorsal scleroites are often reduced. The micrographs below are dorsal and ventral views of an adult aptera of Cinara pinea in alcohol. Cinara pinea are found on young trees and new shoots of Scots pine (Pinus sylvestris) although sometimes on other pine species including Corsican pine (Pinus nigra) in dry areas. 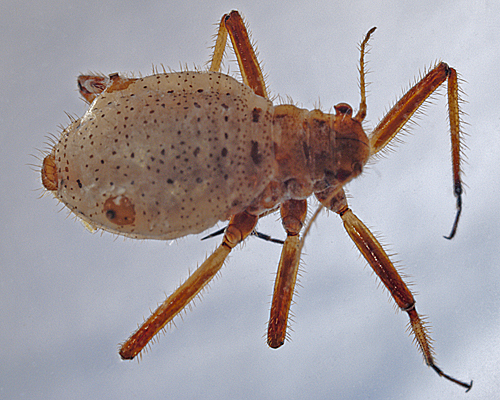 Oviparae and males can be found in October. 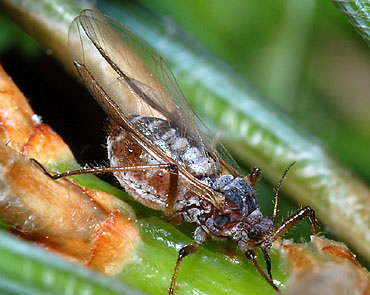 The large pine aphid is found throughout Europe and much of Asia, and has been introduced to North America. Cinara pinea overwinters as eggs on the current year's needles of Scots pine. The freshly laid eggs are yellow brown but soon change to shiny black. Kidd & Tozer (1985a) found that although eggs are sparsely distributed, they are aggregated with respect to both shoots and needles. They also appear to be aggregated with respect to tree. When sampling young scattered pine trees in April, we found that some trees had mainly (or only) Cinara pinea, whilst others had only Cinara pini. Kidd & Tozer (1985a) estimated egg mortality between oviposition and hatching at about 50%. Diapause was broken by increasing daylength after the winter solstice with the eggs hatching in March. 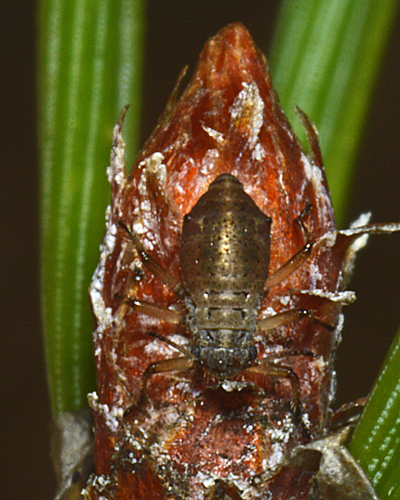 Nymphs of Cinara pinea are mainly aggregated on those twigs bearing needles developed during both the current and previous year (Kidd & Tozer, 1985b). 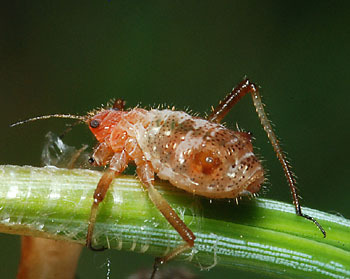 Aggregation does not appear to involve gregariousness between aphids, but is influenced by nymphal "inertia". The smallest instars tend to feed next to the bud at the shoot tip, in contrast to the apterae which feed mostly on second year twigs. 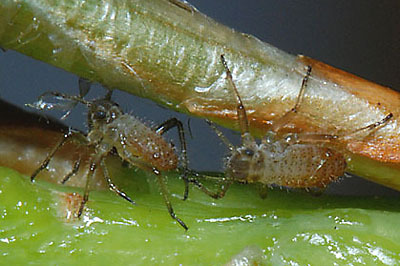 The aphids tending to be more abundant in regions where the shoots are thinner and the phloem is nearer the surface. 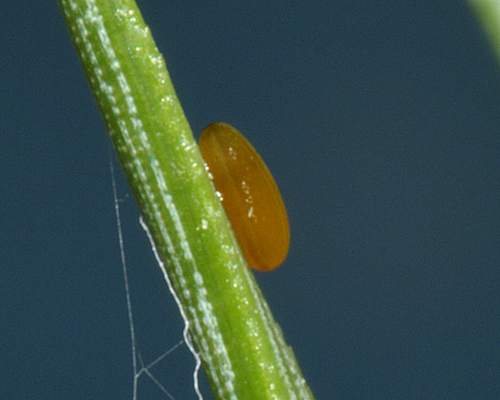 Although Cinara pinea usually overwinters in the egg stage, in mild winters it may overwinter as viviparae. On 11th January 2004 we ventured out on an unusually mild morning to look for aphids close to Selwyn Wood in East Sussex. The area is well known for its southern wood ant (Formica rufa) populations, which favour the presence of Cinara species on the trees. But as per-normal in mid-winter all the ant nests looked completely inactive - not an ant in sight. Nevertheless since not all Cinara are tended by ants we pressed on, then stopped to examine some young Scots Pine trees. Almost immediately, we spotted wood ants on each of the growing tips - And yes, they were very definitely (if not entirely devotedly) tending aphids in the depths of winter!! Photographing this remarkable scene presented some difficulty since, at the slightest disturbance, the attending ants dropped from the plant - and only slowly returned thereafter. Such tardiness was quite understandable given the cold wind and the already-vanished sunshine. 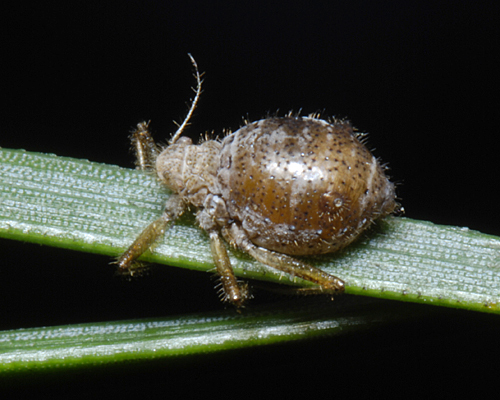 For more on giant pine aphids in mid-winter see giant conifer aphids. Binazzi & Scheurer (2009) give Cinara pinea as being independent from ant attendance, but we have found it is usually ant-attended. 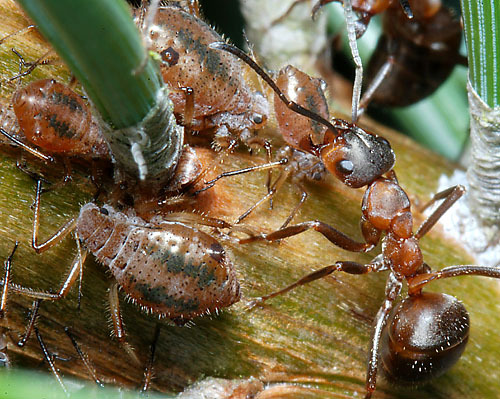 The picture above shows several apterae and nymphs being attended by a southern wood ant (Formica rufa). Working in Russia, Novgodorova (2005) found that Cinara pinea was tended by four Formica species and by Lasius fuliginosus, but not by other Lasius or Myrmica species. 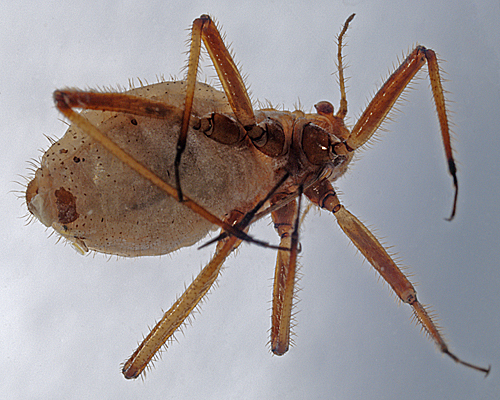 The Formica species did not predate any of the tended aphids, even though they consumed large numbers of other aphid species such as Euceraphis. 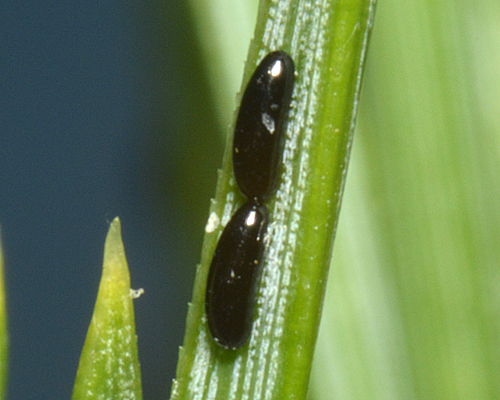 Most adult viviparae are apterous, but for a short period in mid-summer alates are produced in response to aphid crowding and host plant factors. 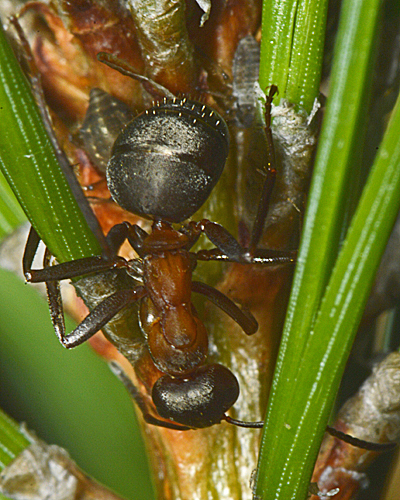 The picture above shows an alate being tended by a southern wood ant. 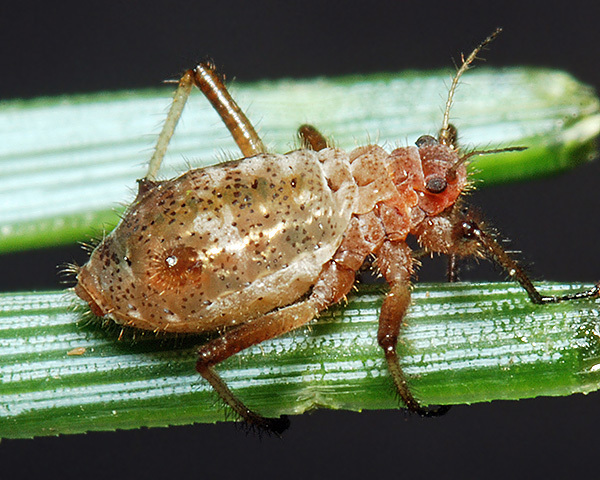 However, unlike in many species of aphids, it appears that alate production is of negligible importance in regulating population numbers (Kidd, 1990). Nymphal emigration, prompted by crowding and declining plant quality, is much more important. Various natural enemies have been recorded. 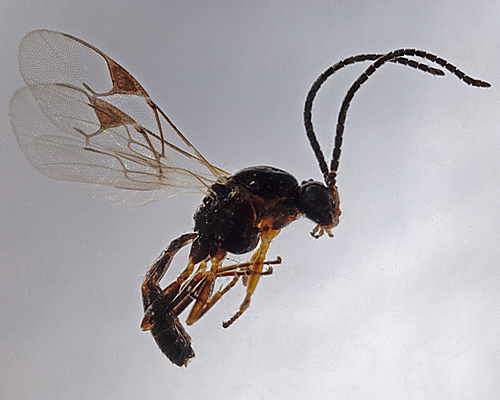 Cinara pinea has a specialized parasitoid, Pauesia picta, shown below along with the parasitized mummy. 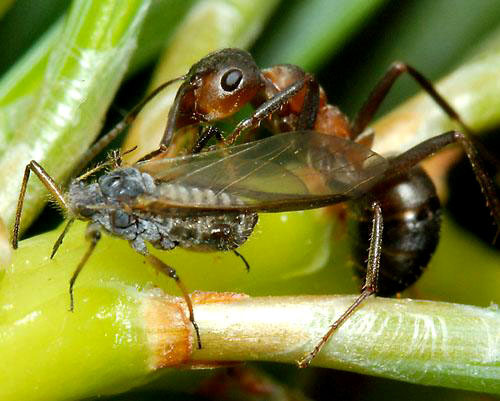 These parasitoids use the wood ants as cues to find aphids, and are apparently not predated by the ants (Völkl & Kroupa, 1997; Völkl, 2000). 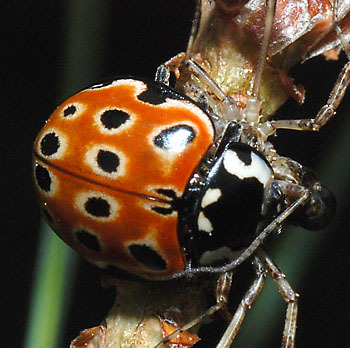 Another natural enemy is the eyed ladybird (Anatis ocellala) shown below. This one was having a change of diet by consuming a harvestman (Opilione sp.) that it found on the pine tree. 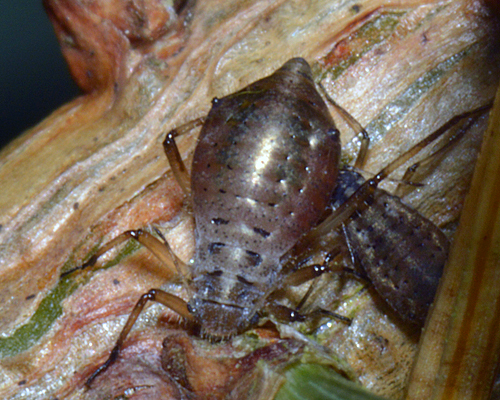 In autumn the oviparae develop (see picture below). They are somewhat darker than the viviparae, and mate with the winged males. The oviparae lay their eggs lengthwise along the axis of the needles, as shown at the beginning of the biology & ecology section (above). Cinara pinea has been recorded from at least 24 Pinus species. Carter & Maslen (1982) report that feeding of conifer lachnids may cause defoliation, reduced growth and reduced resistance to pathogens. This may be caused by loss of nutrients, injection of toxic saliva or the growth of sooty moulds on honeydew deposits. Kearby & Bliss (1969) compared three systemic insecticides for control of Cinara pinea and Eulachnus agilis on Scots pine. Temik gave the best level of control.